Tuning a violin, viola or cello with a clip tuner is a real challenge. Most of the clip tuners are designed to fit other instruments. What was needed was a tuner that clips to the scroll of the instrument. The OT-4 is the answer. 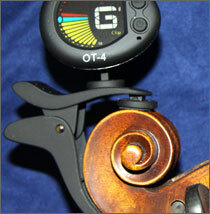 Purchase an Oasis® OT-4 Scroll Clip-On Metro-Tuner from Oasis® today.